More than half of pilots have fallen asleep while in charge of a plane, a survey by a pilots' union suggests. Of the 56% who admitted sleeping, 29% told Balpa that they had woken up to find the other pilot asleep as well. The survey comes after it emerged that two pilots on an Airbus passenger plane were asleep at the same time, with the aircraft being flown on autopilot. Balpa is campaigning against changes to flight-time regulations, which are to be voted on by the European Parliament. On Monday, new rules which include allowing pilots to land an aircraft after being awake 22 hours, as well as being able to work seven early starts in a row rather than the current three, will be put to a vote. The Civil Aviation Authority (CAA) supports the proposals and said the incident on 13 August where both pilots were asleep was an isolated one. In that case, a report found the pair fell asleep after both had only five hours sleep in the previous two nights. But of the 500 commercial pilots surveyed by Balpa, 43% said they believed their abilities had been compromised at least once a month in the last six months by tiredness, with 84% saying it had been compromised at some stage during the past six months. And 49% said pilot tiredness was the biggest threat to flight safety - three times more than any other threat. The union said its members, who were the pilots that were surveyed, overwhelmingly worked for British-based airlines. Balpa wants MEPs to back a motion which would require the European Commission (EC) to withdraw the proposed changes and to have them scrutinised by scientific and medical experts. Its general secretary Jim McAuslan told BBC Radio 4's Today programme that the EC was trying to get a level playing field across Europe but it had instead diluted UK standards. "This is deeply worrying for everyone concerned. "The CAA has been completely complacent about these rules (for pilots to report sleeping incidents). "It suggests to us that they are ignoring this problem. This is the second time in two years that the survey has run that has shown consistent figures with pilots falling asleep." House of Commons Transport Committee chairwoman Louise Ellman said: "I agree with Balpa's concerns that the proposed changes to EU rules could endanger air passenger safety." 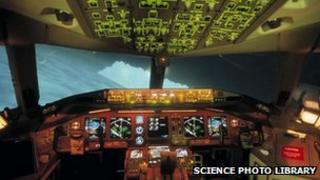 She added: "We have called for scientific evidence to be used to judge just how long pilots should be awake. There is still time for the UK government and Europe to think again." In a statement, the CAA said: "We think the new European flight time limitation regulations maintain the UK's current high safety levels, and will actually increase safety for UK passengers travelling on some other European airlines. "This view is informed by expert opinion, based on scientific principles, operational knowledge, regulatory oversight information and research. ‪"The changes will give the CAA far greater access to airline data to help us oversee fatigue risk management."